In addition to the general functionality offered by axis vMerchant, the following identifies some of the key areas of functionality aimed primarily, or specifically at, dealing with trade accounts in a B2B environment. In this context, B2B means dealing with customers that have special pricing/discounts and/or buy on account. The simple principle of axis vMerchant is that, because of its close integration with axis diplomat, whatever special pricing mechanisms are in use within axis diplomat for a given customer then, when that customer logs in to the website, they see their net prices. These pricing mechanisms can include customer-wide discounts, product-specific net pricing, customer group/product group discounts*, quantity-based discounts* and quantity-based pricing*. Customers configured to use a different currency* will automatically see prices in their local currency when they log in. Depending on how the account is configured in axis diplomat, your customers can purchase on account or be offered a variety of payment options at the checkout as per retail customers. This latter option is ideal for customers who have special pricing but no credit account. 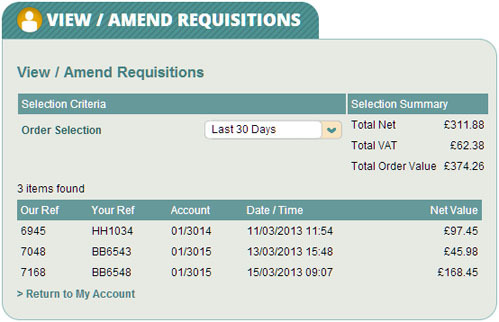 View/Amend Requisitions*, Statement of Account, View / Amend Users and Management Reporting* are all B2B-specific features available for your trade customers. Customers that purchase on account may view their current statement online. Optionally, you may allow customers to settle outstanding invoices using any online payment method(s) that your website supports. On websites powered by an axis diplomat system featuring the eProcurement module, specific users can be configured with spending and requisition limits; if they wish to place an order that is above their spending limit but below their requisition limit, they are allowed to place a requisition (or order request) which can then be approved (and possibly amended) by their manager, turning that requisition into an order. By clicking on any of the entries in the table, the manager is able to convert the requisition to an order (amending it first if required). 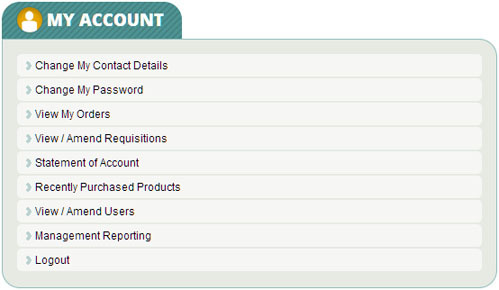 Also available on websites powered by an axis diplomat system featuring the eProcurement module, managers are able to setup their own additional users, giving them spending limits and allocating them passwords. Not all of the information available via the "My Account" section of your website may be appropriate for all users - you can, therefore, restrict information by unticking the "Allow access to account information" option on specific contacts. The manager is also able to adjust these settings using the "View / Amend Users" option. Users that are not allowed access to the account information do not see the Statement of Account, Management Reporting or Orders and Product History for other users. If your website is linked to an axis diplomat system with the eProcurement module, you can also provide your clients with a complete suite of reports that they can run for themselves to analyse their own spending patterns. This is particularly well-suited to those in the consumables, stationery and facilities management arenas, where your customer's purchasing sits outside of their normal purchasing channel and managers need to keep track of what their employees and/or branches are buying. By providing your clients with the management tools that they need to help manage their own purchasing, you build stronger ties with your clients, aiding both the retention of existing customers and the recruitment of new ones. axisfirst is a trading style of Systems AXIS Ltd.
Head Office: AXIS House, 53/55 St Mary Street, Bridgwater, Somerset, TA6 3EQ.